Entertainment Content or Distribution? Which Side Wins? - Plunkett Research, Ltd.
Home > News > Entertainment Content or Distribution? Which Side Wins? Entertainment Content or Distribution? Which Side Wins? Competition in the entertainment & media sector is growing at a fierce pace! 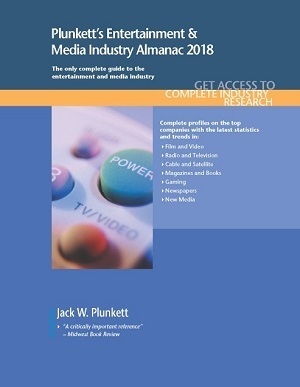 Plunkett’s latest market research into the Entertainment, Media and Publishing industry, its technologies, trends and leading companies, has been published—online and in almanac format. Which Side of the Entertainment & Media Industry Sets the Rules?—Companies that Publish News, Entertainment and Other Content, or Firms that Distribute that Content to Subscribers? Companies that control massive distribution systems (such as internet sites, cable TV channels or magazines) are vital to firms on the other side of the equation: those that publish the news and entertainment. Over the long haul, however, the greatest profits in the global entertainment and media business may come from distribution. Distribution systems tend to generate vast streams of renewable subscription revenues. Nonetheless, distribution companies often have good reasons to diversify into content. Historically, Comcast was focused on its role as a major U.S. cable distribution company, but this firm has evolved dramatically. It acquired full ownership of NBC Universal (a content company). This gives Comcast control of the NBC network, NBC News, MSNBC, CNBC, Universal Pictures, Universal theme parks and resorts and a number of popular cable channels such as Bravo. In other words, Comcast is now a giant in both content and distribution on a very wide scale. In 2018, Comcast agreed to acquire UK-based Sky, a massive broadband and TV delivery system that also produces a large amount of its own content. In June 2018, telecommunications and internet service (distribution) giant AT&T completed its acquisition of content leader Time Warner for $85 billion. This merges Time Warner’s television and film assets, including HBO, Warner Brothers and Turner, into AT&T’s massive business that delivers wireless smartphone connections and internet connections, as well as landlines and other services, to millions of homes and businesses. Earlier, AT&T had also acquired satellite delivery network DirecTV. Disney has long been one of the world’s most powerful content publishers, but Disney is evolving rapidly. Disney’s businesses include the ABC Television Network, ESPN, the History Channel and A&E on the distribution side. Its content-generating businesses include film studios such as Touchstone Pictures and Pixar. It also owns the Marvel comics business. Disney parks, resorts and cruise lines provide additional opportunities to convert content (such as Mickey Mouse) into revenue through distribution (such as the sale of Mickey-logoed apparel at theme parks). Meanwhile, the Disney Interactive Studios generate video games and Disney Online runs web sites. In July 2018, in one of the largest media industry mergers of all time, Disney acquired Twenty-First Century Fox’s movie and TV studios, in additional to other assets including Fox’s 30% state in streaming entertainment service Hulu, for $84 billion. Long gone are the days when television and radio programmers enjoyed captive audiences who happily sat through ad after ad, or who planned their schedules around a favorite show. Consumers now demand near-total control over what they watch, read and listen to. Pricing for content, including free-of-charge access versus paid subscriptions; illegal downloads versus authorized downloads; and full ownership of a paid download versus pay-per-view. Portability, including the ability for a consumer to download once and then use a file on multiple platforms and devices, including tablets and smartphones, or the ability to share a download with friends or family. Delayed viewing or listening, such as viewing TV programming at the consumer’s convenience via TiVo and similar digital video recorders. Available to Plunkett Research Online subscribers See more information about the online edition here. Also available in Almanac Editions. Publication Date: January 2019 | Price: $379.99 Printed ISBN: 978-1-62831-481-6 eBook ISBN: 978-1-62831-805-0 See the complete listings of book contents and details here. This entry was posted in News on April 15, 2019 by NOTadmin.